Kouhei is an aspiring photographer with a very special talent for photographing ghosts. This ability does not stem from higher spirituality or any affinity he shares with the other side. It’s rather the complete opposite. You see Kouhei is so spiritually dense that ghosts don’t affect him, nor does magic – or anything vaguely mystical for that matter. Thus Kouhei finds himself on yet another paranormal assignment taking pictures in a particularly sinister old, abandoned castle. During his exploration, Kouhei meets a girl who introduces herself as Hazuki. But Hazuki is no ordinary girl; she’s a vampire princess who’s been imprisoned in the castle by her father. Kouhei, being as dense as he is, notices nothing out of the ordinary about Hazuki and is instead more interested in having her model for him than anything else. After realising that her Vampiric power has no effect on Kouhei, she is forced to resort to more blunt ways to persuade him to free her. Once Hazuki has been liberated, she is left with nowhere to go so she decides to move in with Kouhei – in spite of his many objections. I really loved this one. The storyline is sweet even though it can get quite silly every now and then with certain elements treading just behind the safety margin of over-the-top. If one were to really get down and analyze the underlying plot however, it’s actually a very compelling little story and by mixing it with very quirky humour, Tsukuyomi: Moon Phase retains a good balance of serious and funny. There’s nothing worth mentioning, good or bad, about the artwork. It has a relatively generic and sometimes flat appearance but it’s tolerable. The animation’s not too great either in a lot of areas. There are a small number scenes where budget constraints on the animation become quite apparent but they are few and far between so it didn’t really bother me too much. Most people won’t even notice. The soundtrack was reasonably good excluding the main intro theme. There is a fine line between “kawai” and just plain annoying and that opening theme came close to crossing said line. 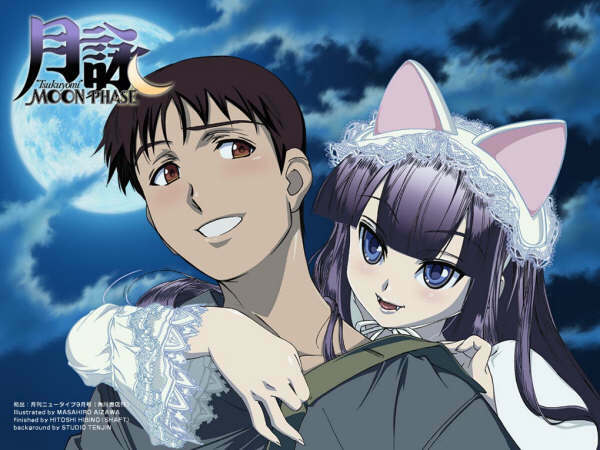 All in all though, Tsukuyomi: Moon Phase turned out to be a really fun anime and despite its few shortcomings, it’s on my list of favourites and definitely worth watching as it should appeal to just about any anime fan in some way or another. This entry was posted in O-Blogive, Otakudom and tagged Anime, Hazuki, Kouhei, Moon Phase, Shaft, Tsukuyomi, Tsukuyomi Moon Phase on January 21, 2010 by nonzyro.